Marvel Holiday Funko Pops Are Here | Nerd Much? 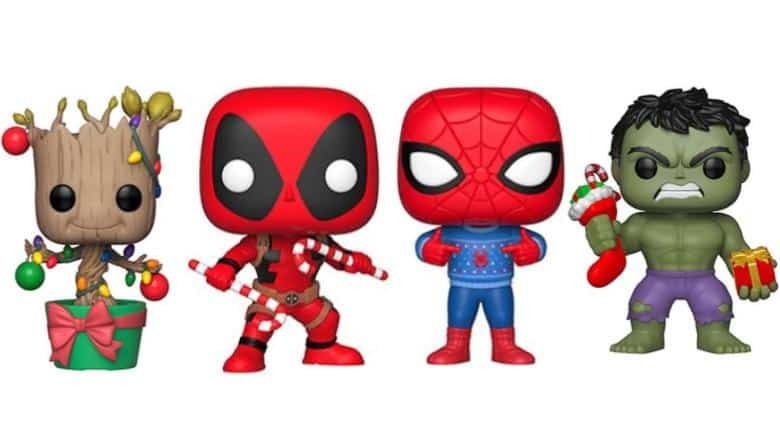 Funko has released a new line of Marvel holiday Funko Pops specifically for the upcoming 2018 Christmas season. You can pre-order the holiday versions of Groot, Deadpool, Spider-Man, and the Hulk. These are great gifts for the nerd in every family and exceptionally affordable for folks on a budget this year. Get the one they’re sure to love before November because virtually all Funko Pop! figures are notorious for being hard to find after the initial release. The Groot figure competes for the cutest out of all four holiday figures. Groot is in his baby form, as he was at the end of the first Guardians of the Galaxy movie. He isn’t dancing this time, though. For the holiday season, Groot is entirely done up like a Christmas tree – little bobbles and lights included. Even his pot is properly decorated green with a bright red bow. Deadpool is almost plain in comparison to holiday Groot, but his holiday theme couldn’t be more fitting. He is posed and ready to give you the ultimate sweet tooth with two giant candy canes. It seems Deadpool plans to kill with sardonic humor and cuteness this holiday season. Spider-Man, in the true fashion of his Tom Holland incarnation, is wearing an ugly Christmas sweater and proudly pointing to the spider logo on the front. Perhaps Aunt May was kind enough to knit it for him, like the superhero version of a Weasley sweater. If so, May probably made one for Tony Stark too, despite Peter’s protests. Last but not least, we have the Hulk. Big, green, and utterly impressed, this version of Hulk is holding a red present in one hand and squeezing the life out of a Christmas stocking in the other. All figures can be pre-ordered now from Entertainment Earth for the reasonable price of $10.99 USD each. If you order now, the figure will ship in November 2018, so you should have it in time for the holidays.